Jammu, May 3: Security forces including Indian Army, state police and CRPF personnel are working together to deal with and eliminate any threat posed to the Amarnath pilgrims. Notably, Jammu and Kashmir Governor N N Vohra reviewed the security plan for the Amarnath yatra in a meeting that was attended by DGP S P Vaid and Chief Secretary B B Vyas. 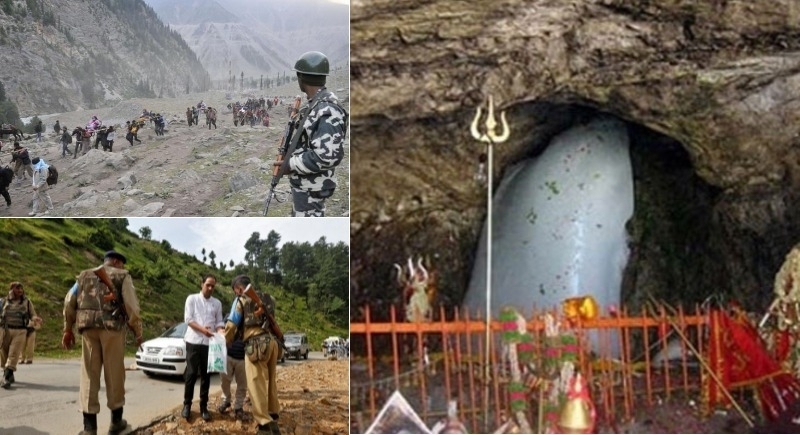 Briefing to the higher authorities, Jammu and Kashmir’s Inspector General of Police (IGP) S D Singh Jamwal said that security forces including Indian Army, state police and CRPF personnel are working together to deal with and eliminate any threat posed to the Amarnath pilgrims. “Efforts are being taken to make the yatra to the 3,880-metre high holy cave shrine of Amarnath peaceful and without any incidents,” IGP Jamwal said adding that last year not a single untoward incident was reported from the Jammu province during the yatra due to stringent security arrangements and we are sure that the pilgrimage will pass off peacefully this year also. IGP Jamwal also stated that the forces are working round the clock. “Our attempt is to ensure a peaceful yatra and we are confident that the yatra will be concluded peacefully," he concluded. The 60-day long annual yatra to the holy cave shrine of Amarnath in South Kashmir Himalayas will commence on June 28 via both Baltal and Pahalgam routes and will last till August 26 of this year. Importantly, this year's yatra will be longer by 20 days against last year's 40 days which has brought a joy to the devotees. So far, over one lakh pilgrims have already been registered so far across the country and advance online booking of helicopter tickets for the Amarnath pilgrimage will commence on April 27 and will end on Raksha Bandhan day on August 26. Over 7 lakh pilgrims visited the shrine last year. The cave shrine is situated at a height of 3,888 metres above sea level and has two routes leading to it, one from Pahalgam, about 100 km from Srinagar, and another from Baltal, 110 km from Srinagar. The pilgrimage routes pass through high mountains and glaciers, involving a steep climb, and most of the track, despite clearance of snow, is slippery and full of slush, making it difficult for the pilgrims to negotiate the tortuous terrain. A naturally made stalagmite of snow considered to be an ice "lingam" or icon of Lord Shiva is the main attraction of the cave shrine. It is believed that Lord Shiva had narrated the tale of immortality to his consort, the Goddess Parvati at the cave. Thus, it is known as "Amarnath", which when translated means "Lord of immortality".